Untitled (No. 11) has been featured prominently in major museum retrospectives including seminal exhibitions at the Contemporary Arts Museum in Houston, the Neue National-Galerie in Dusseldorf and The Solomon R. Guggenheim Museum in New York. Untitled (No. 11) will be on view in London in October before being sold at auction in New York on November 12. Untitled (No. 11) is a magisterial painting created by Mark Rothko in the early part of 1957, at the height of his mature period. A warm, rich, orange sunset of a painting, seemingly radiating with the awesome power of three shimmering rectangular forms – each pulsating with turbulent, fiery energy – it is the largest of a sequence of similarly colored paintings that Rothko painted in this landmark year. This short sequence of luminescent works, which includes such paintings as the similarly structured No. 10, now in the Menil Collection, Houston, was to prove, with notable but increasingly rare exceptions, among the last of Rothko’s more brightly-colored series of works. In 1957, having reached the height of his powers and maturity as an artist, Rothko finally began to enjoy the fruits of his success. This year was to prove the first time that the artist had been ‘able to live by my work… in my 53 years of life,’ he proudly announced. Between February and March of 1957, Rothko had spent time in New Orleans as an artist in residence at Newcomb Art School, part of Tulane University. There he enjoyed what he described as ‘a number of benign days of early summer, sun, warmth and lush growth…(away from)… all problems and irritations’ that he anticipated would no doubt ‘reappear in full force’ when he returned to New York. 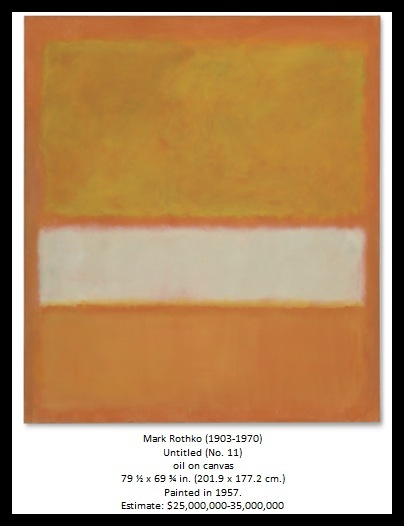 Over the previous three years Rothko’s reputation, along with understanding and appreciation of his work, had grown to the point that the often misanthropic artist was growing defensive of the now increasingly laudatory reviews being given to his work. It is precisely this unique combination of serenity and a ferocious, almost volcanically violent energy trapped and vibrating in the confined space of the work’s surface that is conveyed by a work such as Untitled, (No 11). Like the mesmerizing image of a sunset (or perhaps the more-publicized series of man-made nuclear explosions that peppered the torturous political and psychological landscape of the 1950s), Untitled (No. 11) appears to hover between sublime beauty and a hitherto unknown and immeasurable violence. It establishes an extraordinary balance between the warm luminescence of the glowing colored forms and an awesome primordial sense of unimaginable elemental power. The ‘genius’ of this painting, as Robert Motherwell pointed out, was that, out of pure color, Rothko had created a profound and moving ‘language of feeling’. Untitled (No 11) is not a ‘picture of an experience’ Rothko insisted, it is an ‘experience’. And, if people ‘want sacred experiences,’ he said, ‘they will find them here. If they want profane experiences, they’ll find them too. I take no sides.’ He wanted his paintings to radiate with such power that they established an undeniable sense of ‘presence’, so strong that, ‘when you turned your back to the painting, you would feel that presence the way you feel the sun on your back’.